You may have heard about the cafe for bike commuters, but what about a hangout for casual riders? That’s what two native local entrepreneurs had in mind when they opened the Little Red Bike Cafe in Portland, OR last year. What makes it a bicyclist’s third place? 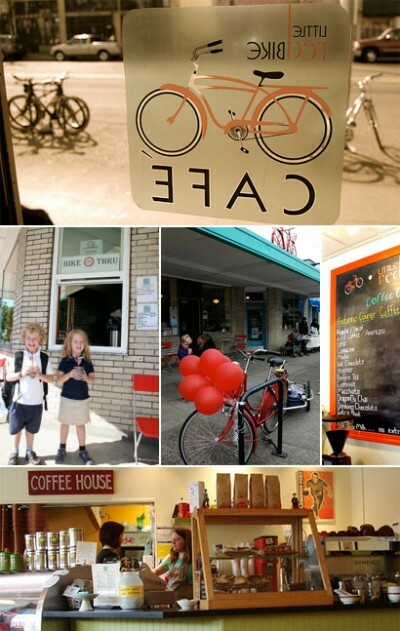 – The bike-thru – Little Red Bike Cafe’s version of the drive-thru (pictured behind the kids). Plus a 50 cent discount on your coffee if you bike. – Lots of bike parking. – A very well written and illustrated blog all about the kinds of food, events and culture bikers enjoy. – Bicycle repair kits for sale. – Bicyclists tend to be conscientious of the environment, thus the emphasis on local and organic produce whenever possible; homone, antibiotic and nitrate free meats; and cafe-free vegetarian fed eggs. Thanks to Luke Graven for the reference.